Image: Flexible Li-ion conducting ceramic textile - flexible and retained the physical characteristics of the original template - its structure enables long-range Li-ion transport pathways via continuous fibers and yarns, high surface area/volume ratio of solid ion conductors and multi-level porosity distribution. In the last few years, much time, effort and resources have been put into the development of battery technology that is safe, efficient, cheap to produce, and eco-friendly. Conventional Lithium-ion (L-ion) batteries typically use liquid electrolytes due to their very high ionic conductivities; however, these liquid electrolytes have numerous drawbacks including flammability, leakage and the formation of dendrites in the electrodes. In an effort to avoid these issues, researchers at the University of Maryland Clark School of Engineering – led by Eric Wachsman (Professor with appointments in both MSE and ChBE and Director of the MD Energy Innovation Institute) and Liangbing Hu (MSE Professor) – have focused their efforts on the development of solid-state-batteries, in this case, utilizing a solid non-flammable ceramic electrolyte known as garnet. 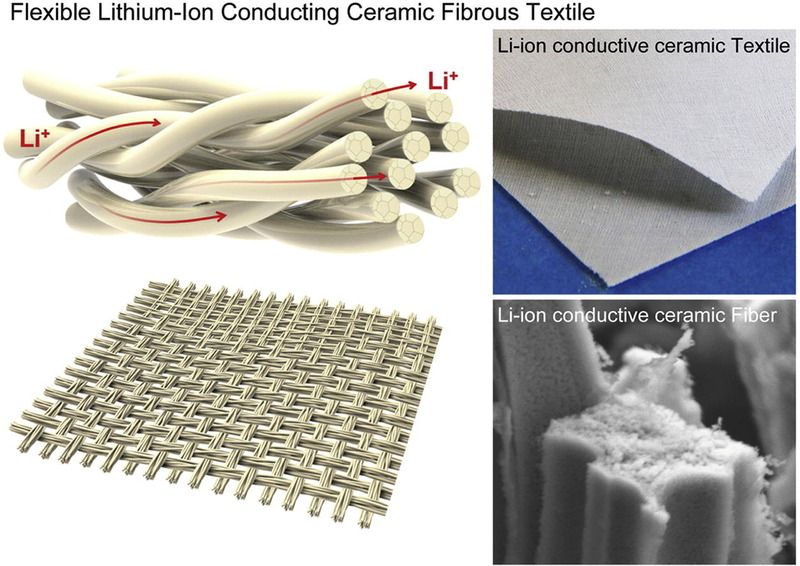 The study, entitled, “Lithium-ion conductive ceramic textile: A new architecture for flexible solid-state lithium metal batteries,” was published online February 2 in Materials Today. Yunhui Gong, a postdoctoral fellow in Materials Science and Engineering, served as the paper’s first author. In their research, the team used commercially available fabrics as a template for creating Li-conducting garnet fiber mat textiles, and then filled in the pore space between the fibers with a solid polymer electrolyte. The result is a highly scalable process to make hybrid ceramic/polymer Li-electrolytes with the enhanced properties of higher conductivity and strength of the garnet ceramic electrolyte. Moreover, the ceramic textile is flexible and cut-table. The group intends to continue their research with this technology, planning to make the textile even thinner to reduce resistance to ionic transport between electrodes. The technology will have a wide-range of applications in commercial electronics.